A fresh start for a new day, that is the expectation that owners have whether your business is in an office building, or a medical facility. Corporate Cleaners has the experienced cleaners and management team and the commercial grade tools to keep your facility looking its best. 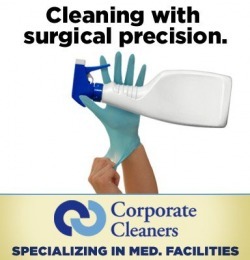 Corporate Cleaners offers both Medical and Professional office cleaning to businesses in the Lehigh Valley, PA.
To schedule a walkthrough of your facility and receive a no cost proposal for services - Call Eric Allred at 877-299-8282. What a great summer! With steady growth in our target markets we have had our best summer ever. We welcome our new clients and dedicate our finest service to their facilities. this summer Corporate Cleaners lost a valued employee - Supervisor Rita Youngkin. Rita has taken a full time position with another company that will allow her to retire with her husband in the next few years. Rita we wish you the very best! We welcome to our staff Ruben Figueroa - Supervisor. Ruben has a great record of operations management with a large and diverse janitorial staff. Ruben is also well skilled in total facility maintenance, including Carpet cleaning, floor care and window cleaning. Say hello to Ruben as he makes his way to your facility. This fall is a great time to start a cleaning program with Corporate Cleaners. We are offering our FALL SPECIAL - An introductory carpet cleaning for new clients that start before December 15th. If you are looking to make a change in your service, this is a great time to take advantage of an outstanding offer from Corporate Cleaners. - Call today 877-299-8282. Corporate Cleaners announces Free Trial Week. Try Our Johnson Diversey Healthy High Performance Cleaning Service for Free! How would you like to have Corporate Cleaners outstanding service for one week completely free, “on the house”, “gratis”, with no cost or obligation? A completely risk free trial. If your business customarily uses janitorial services three or more times a week then you’re automatically qualified for this free trial. You see, our services are delivered through a very special cleaning methodology known as the Johnson Diversey Healthy Performance Cleaning. It is the first cleaning system certified for indoor air quality. This system delivers dependable and consistent office cleaning services without the quality variations found in many janitorial services. We have a great deal of confidence in the Healthy High Performance Cleaning System. That’s why we assume all of the risk in providing you with a week long free trial. We want to make sure you have every reason to experience this service and no reasons not to. If you find Corporate Cleaners exceeds your expectations then you may choose to keep us on as your preferred vendor. If, for some reason, you’re disappointed or even not delighted with the free week of cleaning then you are under no obligation to continue the service and you’ll have benefited from a week of great janitorial services that didn’t cost you a dime. You Simply Can’t Lose With This Proposition! Yes, I would like a janitorial service proposal from Corporate Cleaners of the Lehigh Valley LLC. I understand that I may qualify for up to one week of free janitorial service without any cost or obligation. I understand that with Corporate Cleaners I will only pay for work that is completed to my satisfaction and to my standards. We have implemented this simple satisfaction guarantee: With Corporate Cleaners you only pay for services that are completed to your satisfaction. If there is a deficiency in the service you receive from Corporate Cleaners we want to know about it. We will, of course, resolve the deficiency, but in addition to that we will never charge you for work that is not completed to your standards and to your complete satisfaction. That’s the Corporate Cleaners 100% Satisfaction Guarantee! As a participating vendor of Valley Preferred , our mission has always been to deliver our clients the highest level of quality janitorial services, cutting edge cleaning technology solutions, and the most up-to-date educational resources available. In support of this mission, we are excited to introduce you to i-clean. i-clean is the first-of-its-kind digital education tool that visually communicates, your buildings cleaning needs, industry standard cleaning times for each area and available treatment options for your specific type of cleaning needs. i-clean is revolutionary because it is turns your building maintenance evaluation into a customizable visual examination of your entire facility. It was designed to alleviate the confusion that can arise during the evaluation process, educate you about the range of services available, and align the appropriate solutions to your needs and budget. What’s more, i-clean is exclusive to Corporate Cleaners! You’ll feel confident knowing that you’ve made informed choices about your facility maintenance, so you can focus your energy on growing your business. Call (484-221-3465) today to experience i-clean for your business. As a valued client, if it’s determined in your i-clean evaluation that your facility maintenance could improve with Corporate Cleaners, we’ll give up to $500 off your initial carpet shampoo and extraction cleaning when you register for a one year service agreement! I look forward to experiencing i-clean with you. Test Drive Our Services! Save the date for our Fall kickoff event at Lehigh Valley Grand Prix. October 20, 2009 7-10 PM. Take our Services for a spin! Corporate Cleaners is in the race for super customer service and quality cleaning of your facility. Learn more about our cleaning services and take a Test Drive in "The Cleaner". 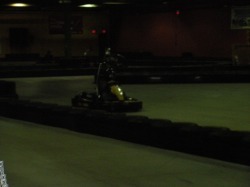 our sponsored race cart at Lehigh Valley Grand Prix! 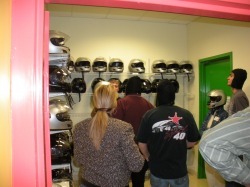 Go ahead, kick the tires, take us around the Track and see for yourself why our valued customers not only keep us coming back, but also refer us to their friends and neighbors. See the Fall Test Drive Special coupon below! call Corporate Cleaners at 484-221-3465. 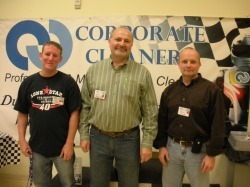 What do local Lehigh Valley business managers think about Corporate Cleaners? Eric and his team at Corporate Cleaners have done a great job in maintaining a clean environment in our schools and are very responsive to all our needs and requests, it has been a pleasure to work with them. My office has never looked better. 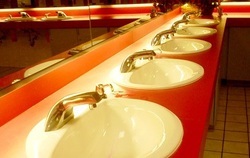 Corporate Cleaners attention to detail separates them from all the other cleaning companies. It is obvious their trustworthy team takes pride in their work. We are quite pleased with the services provided by Corporate Cleaners and would not hesitiate to refer them to our friends, neighbors, and colleagues. Bethlehem Ear Nose and Throat Associates, Inc.
Fall is here, and it is a great time to Test Drive our Services. Let the professionals at Corporate Cleaners get the job done right for you. A clean well-kept office makes a good impression, and is essential to promoting a professional image. When your environment looks good and feels good, it improves performance, productivity and health. Don't forget to take advantage of our Test Drive Special. We look forward to serving you. Corporate Cleaners provides free estimates on cleaning services. Cleaning service contracts are annually renewable from the date of the confirmation of services. One time services are not annually renewable. Lots of Buzz from this ad on RT. 22 this month! What a great month to get the word out about Corporate Cleaners! Adams Outdoors has once again done a great job on our billboard advertising. We had more comments about this ad that ran on the digital square on rt. 22 than any of our other ads combined. This was a great catchy ad that generated a good buzz and a few proposals for services. 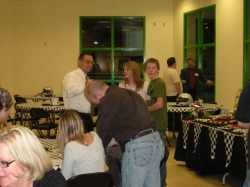 Thanks to all our sponsors and guests at the Winner's Circle event at Lehigh Valley Grand Prix. 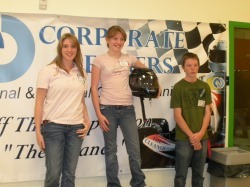 We had a great time racing cars and catching up. 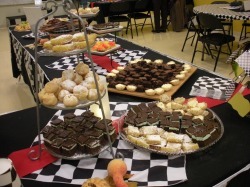 The food was great and the competition for best time was fierce! A special Thanks to Sally Handlon of Handlon Business Resources LLC for taking charge of the evening's festivities. Sally and her team did a great job in making this a great event for our company. Also a special thanks to the following sponsors of our event: Who provided items for our drawing. Party Warehouse, Jack's Glass, Printex Printing, and Handlon Business Resources. E It's Time For Spring Cleaning! Do you notice how the dirt and grime of winter has left your carpets soiled, the tile floors in need of a good scrubbing and your windows in need off a thorough cleaning? The professionals at Corporate Cleaners are ready to give your office a fresh start for the Spring. See the Spring Cleaning Special coupon below for 25% off Carpet Cleaning. 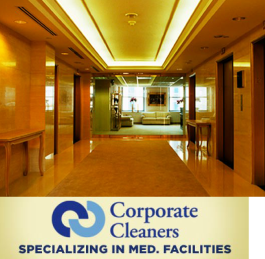 Corporate Cleaners As a full service janitorial company, Corporate Cleaners provides expert janitorial services to professional and medical offices in the Lehigh Valley. We work with our clients to maintain a professional image in the workplace; making it neat, clean and ready to work. There is a good feeling in having a fresh start for a new day. Next time you need janitorial services such as office cleaning, carpet or floor care, window cleaning, construction clean up or power washing, call Corporate Cleaners at 484-221-3465. We are quite pleased with the services provided by Corporate Cleaners and would not hesitiate to refer them to our friends, neighbors, and colleagues. Mary Anne Martini, Office Manager Bethlehem Ear Nose and Throat Associates, Inc.
Winter is finally over and now it is time to get out the broom for a good spring cleaning. Let the professionals at Corporate Cleaners get the job done right for you. A clean well-kept office makes a good impression, and is essential to promoting a professional image. When your environment looks good and feels good, it improves performance, productivity and health. Don't forget to use the coupon attached below for 25% off carpet cleaning. We look forward to serving you. Corporate Cleaners of the Lehigh Valley Corporate Cleaners provides free estimates on cleaning services. Cleaning service contracts are annually renewable from the date of the confirmation of services. One time services are not annually renewable. Spring Cleaning special offer. 25% off Carpet Cleaning. Simply print this coupon and present it in person for 25% discount on your carpet cleaning. This coupon is tranferable, please share this offer with friends and family! The professional staff at Corporate Cleaners are ready to give your office a fresh start for a new season. Have you seen our newest billboard around Bethlehm? Your office is our concern, to provide services that help maintain a professional work environment for you and your staff.